When you stop having dreams and ideals – well, you might as well stop altogether. When I sing, I don’t want them to see that my face is black. I don’t want them to see that my face is white. I want them to see my soul. And that is colorless. Prejudice is like a hair across your cheek. You can’t see it, you can’t find it with your fingers, but you keep brushing at it because the feel of it is irritating. A singer starts by having his instrument as a gift from God… When you have been given something in a moment of grace, it is sacrilegious to be greedy. 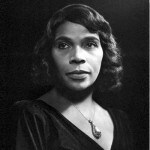 Marian Anderson was an African-American contralto and one of the most celebrated singers of the twentieth century. Music critic Alan Blyth said "Her voice was a rich, vibrant contralto of intrinsic beauty." Most of her singing career was spent performing in concert and recital in major music venues and with famous orchestras throughout the United States and Europe between 1925 and 1965. Although offered roles with many important European opera companies, Anderson declined, as she had no training in acting.